Published: Jan 10, 2015 to ? The plot centers around a Grail War faultily copied from the Third Holy Grail War in Fuyuki. After the end of the third Grail War, an organization from the United States that has magi separate from the London-based Mage Association as members took data from Fuyuki's Grail War and planned their own ritual. After seventy years, they used the city Snowfield as the Sacred Land for their own Grail War. They were unable to successfully copy every aspect of the ritual, which lead to it acting only as an imitation that has lost the Saber class and allowed for the summoning of strange Servants due to the definition of a "hero" being blurred. Originally conceived as an April Fools joke on Narita's homepage, the text, titled Fake/states night, was removed following April 1, 2008. It was later released in a revised novel format included with the second volume of TYPE-MOON Ace (2009). In 2015 it was officially published as a light novel by Kadokawa under Dengeki Bunko label. Alternative setting: Fate/stay night, Type-Moon Gakuen: Chibichuki! While reading the first volume (the 2009 version) I found myself enjoying it, quite a lot. The first time I read about this Strange Fake novel, it did not wake any interest in me, I mean, I did not find even the title very appealing at the moment, but I am glad that I did read it now because it is just a fantastic piece to read. I found myself wanting to read more, chapter after chapter, really interesting. I fell in love with it. I was hyped to read this because of Gilgamesh, I wanted to “see” him in action once again, and when he appeared it was awesome. I’m impatient to see how he develops in this Fake Holy Grail War. To the current date, this became more than an April’s Fool joke, or a fake prologue to a “game” (I’m glad it did not become a game, I hate those stories in where YOU are the main character…that’s why I prefer LN, manga and anime over games/VN). In any case, the translation of the LN volumes is very slow (Currently 2 volumes are published, and I think not even the first volume is translated) and the manga seems to be translated further but not by that much compared to the novel. Anyway, this was a GOOD read. I enjoyed reading, I gave it complete attention, it entertained me, kept me wondering what was about to happen, and made me pass page after page. It looks like a dark story like Fate/Zero in terms of how dense the plot is, and those a great news! Each art used was beautiful, I can't complain. Both Servants and Masters seem to be very interesting. You have to read to understand, but I know they all have great stories, and hell, you will may even spot familiar faces. I enjoyed this so much, again, I'm glad this did not end as a joke, and by the time I'm writing this, it became a full real story being published in Light Novel format and Manga format. The problem is the translation jaja. As a person who just recently got into Fate series, I never thought I'd ever dig up this little gem--and fall in love with it no less. 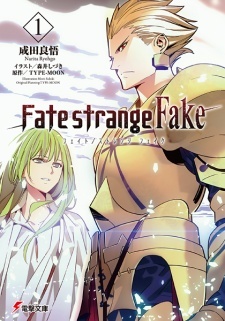 I'm sure most are aware already but in case you aren't, Fate Strange Fake *as of now* is only a prologue that will soon be adapted into another Light Novel and into a Manga--so take that into account as I review this. What the story has is great potential. It's one of those that could either be really great or fall flat. The art was good to me, now I'm no artist. The character designs all seem very good. No complaints from me. So why not? The characters also have very high potential. Some old characters make an appearance, which is nice. I like that the new characters are unique--most have a small quirk or two that makes them seem like a worthy opponent for the False Holy Grail War. There's just something strange about the characters that attracts me to them. I did not expect this, at all. I thought I'd be indifferent to it but I'm very excited for its story. There is just so much potential, there are just so many things to grip you to it. I really like it because takes things that you may have gotten used to from the likes of Fate Zero, or Fate Stay Night and just twists them in such a way that where they grip your attention. There are so many mysteries, and so much wonder to it--needless to say, I was captivated by it. There are also a *few* lighthearted throwbacks to Fate Zero that I enjoyed--of course complete with its own twist. The chapters are varied. Some are suspenseful, others I got a good laugh at. Either way it had my full enjoyment. I'll end it with: For something that is only a prologue thus far, *and* was originally made for an April Fool's Joke I was very impressed, and am very happy that it will be continued!